MIAMI – Capitalizing on the success of its shipboard breweries, Carnival Cruise Line has partnered with Lakeland, Florida-based Brew Hub to become the first cruise line to can and keg its own private label beers crafted by its in-house brewery team aboard Carnival Horizon and Carnival Vista. 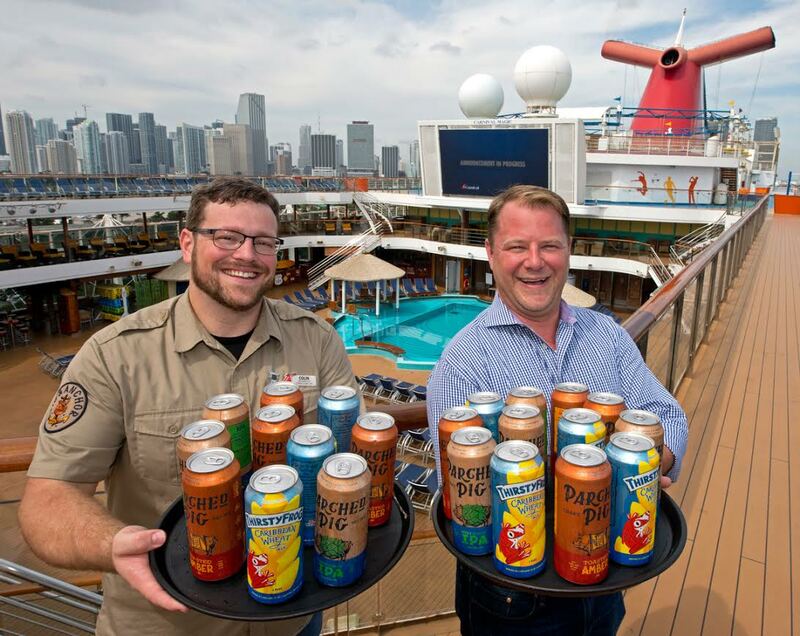 The agreement – the first of its kind between a craft beer manufacturer and a major cruise line – was announced Sunday, March 17, at an event aboard Carnival Magic at PortMiami. Thirsty Frog Caribbean Wheat: an unfiltered wheat beer with flavors of orange and spices. Parched Pig West Coast IPA: the embodiment of a traditional West Coast India Pale Ale, this hoppy, intense beer is loaded with bitterness with a bright flavor profile and distinctive aroma of citrus and pine. Parched Pig Toasted Amber Ale: highlighted by its rich amber color and notes of toasted caramel and biscuit, this beer is well balanced, smooth and highly drinkable. Since introducing the first North American brewery at sea in 2016, Carnival has served nearly 300,000 pints of its private label craft beers to its guests. Much like breweries on land, Carnival’s brewery team has also taken advantage of seasonal products and created unique brews like a Miami Guava Wheat and Pumpkin Spice Ale. A brewery will also be featured aboard Carnival Panorama when it debuts in California in December 2019. Carnival Cruise Line, part of Carnival Corporation & plc is “The World’s Most Popular Cruise Line” with 26 ships operating three- to 24-day voyages to The Bahamas, Caribbean, Mexican Riviera, Alaska, Hawaii, Canada, New England, Bermuda, Cuba, Europe, Australia, New Zealand, the Pacific Islands and Southeast Asia. The line currently has three new ships scheduled for delivery – Carnival Panorama set to debut in 2019, Mardi Gras in 2020 and an as-yet-unnamed ship in 2022.